Should Electronic Cigarettes be Banned? California lawmakers are scheduled to consider SB 648 Tuesday which would ban the increasingly popular "electronic cigarettes" in the same areas where actual cigarettes are banned. Some 100 e-cigarette users in Southern California are planning to take a bus to Sacramento Monday night to testify in front of lawyers about the benefits of "vaping." "I usually vap throughout the day; I grab it when I need a hit of nicotine," said Rodney Johnson, owner of Beach City Vapors in Signal Hill, who recently quit smoking after 25 years. "I feel 100 percent better. I'm no longer winded when I’m walking up steps," he said. "I wake up in the morning and instead of wanting that first cigarette, I don't even vap for an hour or two hours before even leaving home." Electronic cigarettes allow the user to ingest nicotine and vapor, but they do not give off smoke. Instead, the user exhales water vapor. The nicotine is heated inside the device, and available in different dosage in flavored cartridges. "I switched to electronic cigarettes because I was looking for a healthier alternative to stop smoking tobacco," Pamela Cube said. "I've tried many other ways, but this has been the most successful product for me." 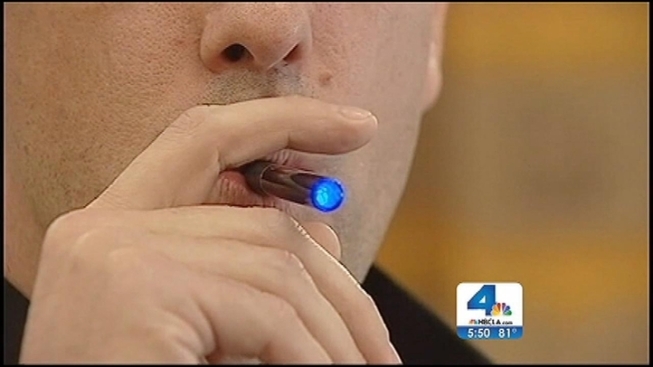 Lawmakers want to ban the e-cigarettes because they believe it could encourage smoking. They argue the products should be in the same category as regular tobacco products. Other critics question whether the second-hand smoke could be harmful. "There is nicotine in it, and there are other impurities," said Dr. Eknath Deo, an oncologist at Long Beach Memorial Medical Center. "You do get second-hand or third-hand smoke." The bill is scheduled for discussion in front of the Senate Judiciary Committee at 1:30 p.m. Tuesday.